The Cathedral Museum in Florence is one of the most interesting museums in Italy. In the building behind the world-famous cathedral, objects from the cathedral of Florence are exhibited. These include, for example, statues (by Michelangelo, among others), the world-famous golden door (Paradise Gate) and the silver altar of the Florence Baptistery. On the 2nd floor of the exhibition you can see some of Brunelleschi’s machines with which he built the Miracle of Florence, the dome of the Cathedral, in the 15th century. Michelangelo made the most famous statue in the world, David, in the building of today’s museum. Where is the Museum of the Duomo Florenz? The museum is easy to find, it is on the cathedral square at the back of the church in the centre, you simply walk around the cathedral. It is difficult to get there by car, as the area is mostly a pedestrian zone. Almost all visitors come on foot, the city centre of Florence is not too big. The exhibition is on the cathedral square surrounding the church on the back of the famous cathedral. As far as we know there is only one ticket for all sights around the cathedral of Florence. These include the cathedral with crypt, the baptistery, the ascent to the bell tower, the ascent to the dome and the museum of the cathedral described here. This ticket for all sights together cost about 18 Euro for adults (in 2019). The common cathedral ticket is called „Biglietto Unico“ in Italian and is valid for 2 days. So you don’t have to look at all the cathedral attractions in one day. Tickets for the cathedral in Florence are available at the museum. In the cathedral, at the entrance of the Brunelleschi dome etc. no tickets are sold. The Cathedral Museum is open daily from 9 am to 7 pm. Not all sights around the cathedral have such long opening hours. At the cash desk in the cathedral museum there is a electronic notice board with the opening times of all sights for the next days in English. Caution: „Dome“ means going up the dome, „Cathedral“ the interior of the church. What to see in the museum of the cathedral of Florence? A lot! Especially since the 19th century, more and more works of art from the cathedral has moved in the cathedral museum. The museum was completely renovated just a few years ago. The reconstruction including the enlargement of the cathedral museum is said to have cost more than 40 million Euros. The modern exhibition (reopened in 2015) is to be twice as large as before and covers an area of well over 5,000 m². The most admired exhibit is probably Lorenzo Ghiberti’s famous 15th-century door to paradise on the ground floor of the cathedral museum. 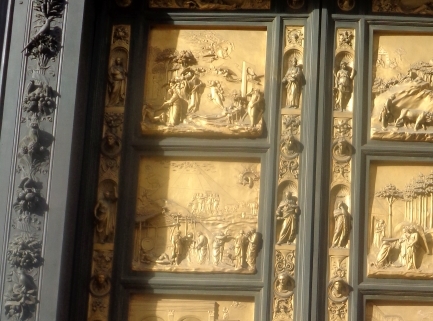 The golden door shows 10 scenes from the Old Testament. The door is actually an entrance door to the Baptistery of the Cathedral of Florence. It is now in the museum of the cathedral, at the chapel 100 meters away on the cathedral square is a copy of the impressive work of art Paradies-Pforte (picture above). The door is one of the most important Renaissance works of art in the world. What is impressive is that Lorenzo Ghiberti depicted the figures three-dimensionally in the pictures. He was perhaps the first person to recognize the mathematical rules of spatial representation. Even Michelangelo is said to have been impressed by the door called „Porta del Paradiso“ in Italian. Another absolute highlight in the Cathedral Museum in Florence is the famous marble sculpture „Pieta“ by Michelangelo, which he made shortly before his death. Michelangelo did not like the Pieta because of the low quality of the marble. He destroyed the sculpture with a hammer. The individual parts were later reassembled. Attention: There are two sculptures by Michelangelo called „Pieta“. Beside the Pieta of Florence there is also the Roman Pieta, also called Vatican Pieta. The term „Pieta“ in art is the representation of Mary with the dead Jesus after the crucifixion. 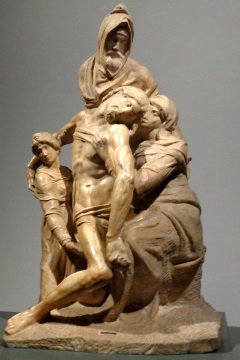 The Pieta in the museum in Florence depicts the Bible figures of the New Testament (Gospel of John) Mary, Mary Magdalene and the dead Jesus held by Nicodemus. Michelangelo, however, has come up with a joke: He gave the biblical figure Nicodemus his face. It is Michelangelo’s only self-portrait. He made the Pieta in a very high age (over 80 years). Maybe he knew that it was his last great work of art and he could therefore make this little joke. In the new cathedral museum the Pieta is housed in its own room, it stands on a pedestal and is wonderfully illuminated. Opposite there are benches on which one can sit down and watch Michelangelo’s Pieta in peace. Another great exhibit is the grandiose silver age from the Baptistery (early Renaissance) from several hundred kilograms of pure silver on the 1st floor of the exhibition – beautiful decorations and the like. The many gold and silver jewellery from the cathedral treasure also appeal to the museum visitors of the church museum. 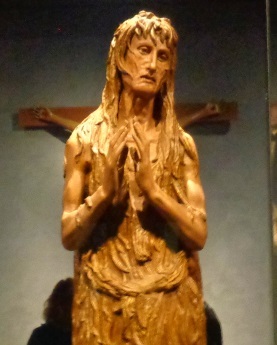 World famous is the wooden figure „Maria Magdalena“ by Donadello (c. 1450). It shows the Bible figure Mary Magdalene as a former prostitute impoverished in rags with scars on her face. The realistic depiction is considered one of Donadello’s best works and is typical of the Renaissance. It is one of the very few works of art in the museum that can only be seen behind a glass pane. Also known far beyond Florence is the marble statue in the ground floor of the Cathedral Museum depicting the Evangelist John (artist also Donadello around 1415). Easily overlooked, since at some meters height, you can see the singing pulpit of Luca della Robbia (1432 to 1435, English „singing gallery“). Like the sculpture Madonna with the Glass Eyes (1310) by Arnolfo di Cambio, it is one of the world-famous works of art in the Cathedral Museum Firenze. In the Cathedral Museum of Florence you can also see parts of the old facade of the cathedral, which was removed from the church at the end of the 16th century. There are many sculptures that are very old. They are among others by the famous sculptor Arnolfo di Cambio (around 1300). Later, the beautiful marble façade was added to the church. Interesting are also the different designs of the new cathedral facade by different more or less known architects in the upper floor..
You can also admire some of Brunelleschi’s tools and inventions, with whose help he built the great miracle of Florence, the gigantic dome on the Cathedral. The design (model) of Brunelleschi’s dome is also on display. In total, more than 700 objects are exhibited in more than 20 rooms in the Cathedral Museum. It is one of the largest museums on the theme of the Renaissance in the world. 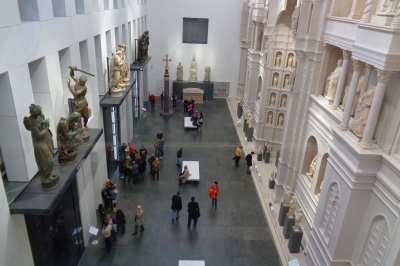 Those who have already been to the „Museo del Duomo Firenze“ a few years ago will be amazed: the Cathedral Museum is now about twice as big and very modern – the reconstruction from 2012 to 2015 is supposed to have cost more than 40 million euros. For us the museum of the church belongs to the Top 10 sights of Florence. In Italian, the Museum of the Cathedral of Florence is officially called „Museo dell’Opera del Duomo“. Opera in this context is not opera, as many German visitors think, but work. Thus, for example, „Museum der Arbeiten am Dom“ or something similar is translated. In English there is a frequent translation: „Museum of the Works of the Cathedral“. It is not uncommon for the Florence Cathedral Museum to be referred to more simply in Italian as the „Museo del Duomo“ or in English as the „Museum of Florence’s Dome“. In English, you rarely hear „Cathedral Museum Florence“. However, it always means the same exhibition. There are even longer names conceivable for the museum of the great church of Florence, for example: „Museo dell’Opera del Duomo di Santa Maria del Fiore Firenze“. There’s toilets on every floor. These are clean and modern. There’s a viewing platform on the third floor. Here you can sit in the sun and enjoy the view of the dome of Florence. All floors can also be reached by elevator. The same applies here: ultra-modern, very large pull-outs and wide staircases. Next to the entrance there is a cloakroom. You can leave bags, backpacks etc. there. Larger bags cannot be taken to the museum, the cathedral etc. In the museum directly there is no cafe, the museum cafe is in front of the entrance. Thus, it is only accessible for museum visitors before or after (not during) the museum visit. It is also accessible without a ticket. For the expensive area around the cathedral of Florence, the cafe is very cheap. An espresso costs 1 Euro, cappuccino 1,20 Euro, small, filled croissants 80 Cent to 1,50 Euro, sandwiches etc. from 2 Euro.